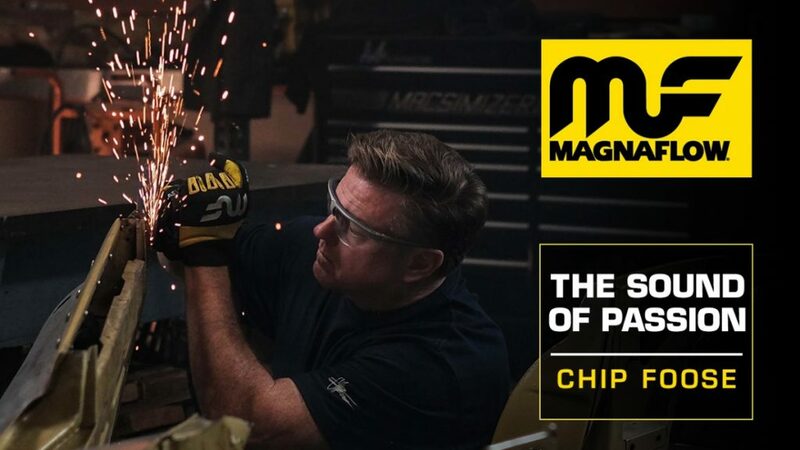 Oceanside, Calif. (January, 2019) – MagnaFlow has announced the release of its latest video spotlight, “The Sound of Passion,” which features acclaimed automobile designer and artist Chip Foose. Foose, who is already an inductee into the Grand National Roadster Show Hall of Fame, will be recognized as the show’s Builder of the Decade at the 2019 show taking place this weekend at the Fairplex in Pomona, California. The nearly five-minute long video puts viewers in the mind of Foose as he narrates and introspectively looks back on his life and career thus far, examining how he got to where he is today. After 31 years of design, Chip Foose has solidified his name as one of the most prominent and well-known automotive designers and builders of the modern era. His diverse repertoire of vehicle designs and builds throughout his career has earned him a lengthy list of accolades, including four Ridler Awards, eight America’s Most Beautiful Roadster awards, seven Goodguys Street Rod of the Year awards, Best Custom Car at the 2014 NACE Expo and the soon to be announced Builder of the Decade award. Foose has also been inducted into the Hot Rod Hall of Fame; Darryl Starbird Rod & Custom Car Museum Hall of Fame; Grand National Roadster Hall of Fame; San Francisco Rod, Custom & Motorcycle Hall of Fame; Diecast Hall of Fame; Hot Rod Hall of Fame’s Circle of Champions; and the SEMA Hall of Fame. In the wake of his father, Sam Foose’s, passing, the video places viewers in the mind of Foose and allows them to experience first-hand the calling Foose felt for automotive design from a young age. In the video, Foose recalls spending countless hours in the shop with his father repairing vehicles by day and building hot rods by night. Although it has been nearly 50 years since the days spent in his father’s shop, the soundtrack of noises from the garage are vividly engrained in his mind to this day. Foose remembers watching his father sketch vehicle designs and the sound of the pencils on the paper. Naturally, he began to emulate his father’s sketches which further fueled his passion from a young age and ultimately led him to attend the Art Center College of Design where he continued to hone his craft. After working as the staff designer/fabricator for the Asha Corporation where he was ultimately promoted to director of design, Foose officially started his own company, Foose Design, in 1989. Since the conceptualization of Foose Design, he has continued to sketch and build revolutionary vehicles. His impeccable vision and craftsmanship earned him a hit television series, “Overhaulin’” which only continued to attract more fans and build the legacy of Chip Foose through the years. This video is available now on the MagnaFlow YouTube channel as well as the MagnaFlow Facebook page. Chip Foose will be showcasing an array of his award-winning collection of vehicles at the Grand National Roadster Show from January 25 to 27, 2019, and will be honored in a special ceremony during the award presentation on Sunday, January 27, 2019. For more information on the Grand National Roadster Show, please visit www.rodshows.com/gnrs. MagnaFlow got its start as a natural extension of Car Sound Exhaust systems. Our parent company specializes in superior catalytic converter technology and has spent the last 30 years earning its reputation as a market leader around the world. We’re proud to continue this tradition through producing the best sounding, best performing and most durable exhaust components in the world. If you’re looking for quality, power and sound, then you’re looking for MagnaFlow: www.magnaflow.com. Visit us on Facebook and Instagram.